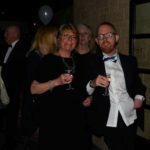 Future Foundations – Raising funds for the new premises appeal. 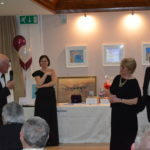 On Saturday 17th February 2018 we hosted our 2nd Dinner and Auction at the Saltford Golf Club. 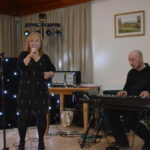 The event raised over £3100, and was held in aid of the Society’s New Building Appeal. 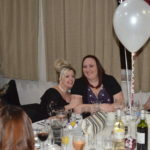 128 guests arrived at 7pm and were greeted with a warm welcome and a glass of prosecco. As the guests were invited to view the auction items live Jazz was performed exquisitely by Nicki Jefferis and Anders Olinder. 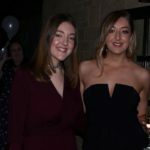 Everyone looked great in their black tie and evening dresses. This year we had a mix of silent and live auction items all generously donated by local organisations, and they included; complimentary pizzas at the new B Block Café in the Chocolate Quarter, kindly donated by St Monica Trust. 2 standard return rail tickets to anywhere in the southwest via Great Western Railway. Dinner for 2 and bottle of wine at the Olive Tree Restaurant in Bath. A beautifully framed limited edition print entitled ‘Reflection’ by local artist Anna Smith. Family passes for Avon Valley Wildlife Park, the Roman Baths, Fashion Museum, Victoria Art Gallery and the Grand Pier at Weston-Super- Mare. A 3 course dinner for two plus wine at the Pig Hotel in Pensford. A 30 minute flight simulator experience donated by Bristol and Wessex Aeroplane Club. A round of golf for 2 at Stockwood Vale Golf Club. A half day retreat for two at the Royal Crescent Hotel in Bath was the jewel in the crown. The evening also included a raffle, and the generosity of local businesses was overwhelming, prizes included a gift voucher from Wild about Flowers, a hot air balloon ride with Bath Balloons donated by Bath Building Society, a family race day at Castle Coombe race circuit, back massage from Pure Beauty in Keynsham, bottles of fizz from Tesco and Sainsbury and a bowling game courtesy of Bowlplex at Longwell Green. Michael Ashbee of Davies and Way once again provided his expert services of auctioneer and kept the guests buzzing with excitement and raising their bids to the max. Our chair Lisa O’Brien gave a heart-warming speech and this year the theme was ‘Family’. ‘We are all part of one family. We support each other and we celebrate the support we receive from our community’. It was great to see a real mix of guests; society members, trustees, staff, volunteers and friends of the society, old and new attended and enjoyed the sumptuous food laid on by the staff of Haywoods Kitchen. 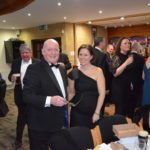 Thanks goes to our corporate guests, who for the second year running have supported our event, iTeam Solutions from Saltford, VansGB of Bath and Toplink Envelopes Ltd all had tables and enjoyed the evening. 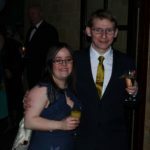 A surprise was in store for us as the evening unfolded, during the speeches Lisa was presented with a cheque for £15,000 from John Angus one of the Trustees from the Mencap Family home which is now known as The Avenue. 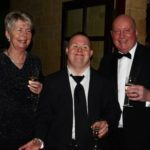 As the Mencap Family home business had come to a close there was surplus funds that the Trustees wanted to distribute to help continue the work that they had done. This very generous donation was greatly received and will be put towards the buildings fund. 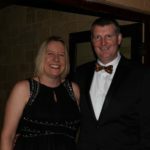 Our Treasurer Russ Pocock gave an update on how our fundraising for our new premises had been going. We have made great steps financially to achieving our goal; ‘To own a premises that will facilitate our existing projects and be suitable for expansion’. Our restricted fund has now reached £85k; however we still have some way to go in our desire to raise £250k by the end of 2019. It’s always good to end an evening on a high and this year is no different as the evening was rounded off with some floor filling tunes courtesy of Delboy Entertainments, a regular DJ with Keynsham and District Mencap Society events, always guaranteed to play music to get everyone up dancing. This event is certainly helps to put us on the map and demonstrates the strength of our supporters and everyone who is involved. So until the next one!